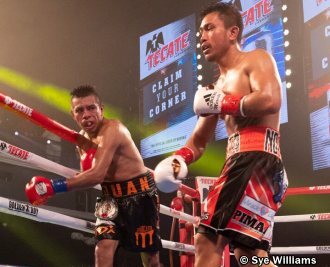 LOS ANGELES, CA (March 21, 2019): Juan Antonio "El Mozo" Rodriguez (30-7, 25 KOs) of Puebla, Mexico scored an upset, ninth-round technical knockout victory over Mercito "No Mercy" Gesta (32-3-2, 17 KOs) of San Diego, Calif. in the scheduled 10-round main event of the inaugural edition of Golden Boy DAZN Thursday Night Fights at Avalon Hollywood. Rodriguez stopped Gesta at 2:55 of the aforementioned round. Gesta vs. Rodriguez was a 10-round super lightweight fight presented by Golden Boy and Paco Presents. The event was sponsored by Tecate,"THE OFFICIAL BEER OF BOXING." The fights took place on Thursday, March 21, 2019 at Avalon Hollywood and was streamed live on RingTV.com.